﻿Jakarta VOI Features – Kajang Tribe/Suku Kajang is one of the tribes who lived in the interior of Makassar, South Sulawesi. From generation to generation, they live in District Kajang, Bulukumba. For them, the area was regarded as a heritage land and they call it, Tana Toa. In Tana Toa, the tribe is divided into two groups Kajang, Kajang Kajang In and Out. Tribe Kajang Outer alive and living in seven villages in Bulukumba. While the tribe Kajang In live only in the hamlet of Castle. In this fortress village, community Kajang In and Out are still carrying out all activities related to customs. Although the tribe Kajang divided into two groups, no differences between them. From the past until now, they always hold fast to the teachings of the ancestors. Based on the teachings of the ancestors, Kajang Ethnic communities should always maintain a balance of living with nature and the ancestors. Indigenous Tribe Kajang, Mansour Embas said that, the public interest in Tana Toa Kajang always live in simplicity. Inside each home residents Kajang, none of the household furniture. There is no chair or mattress. They also do not use any electronic equipment, such asradio and television. They assume, of modernity to keep the tribe Kajang with nature and the ancestors. For the people of Kajang, modernity is also considered as an effect that may deviate from rules of customary and ancestral teachings. They are not easy to accept cultures from other regions. Mansyur Embas, Kajang Interest traditional leaders told first, in Tana Toa no single place of formal education. None tribal Kajang who want to study formally. However, in line with the thinking citizens of Interest Kajang more advanced, everything has changed little by little. Why is that? let’s hear the narrative of traditional leaders Tribe Kajang, Mansour Embas. Kajang Interest Simplicity also you can see from the form of home Kajan. In Tana Toa, all homes built from the same material. Building homes made of wood. While the roof is made of fibers. Not only the material, shape is the same house. That said, this concept does not only show simplicity. They also regard it as a symbol of uniformity. They believe, if there is uniformity there would be no jealousy among the people Spare Kajang. Although it is now open to the public Kajang little cultural influence from outside, customary law and the teachings of their ancestors still hold dear. Any newcomers who want to visit Tana Toa still must comply with all applicable customary rule. To get into the Tana Toa, you must not use modern transportation. In the area of Tana Toa, you are required to walk. As an alternative, you may only ride a horse to circle the Tana Toa. Uniformity and simplicity not only visible from a house. Every day, Kajang tribes also wear the same color. They always wore dark colored clothing. For them, the black symbolizes the simplicity and similarity among communities Kajang. Kajang community, the black color is also used as a symbol for the world they will always remember the end or death. To face death, every society must prepare Kajang as possible since they were born. They must always do good, protect nature, obedient to the commands of God the Almighty One God and the teachings of their ancestors. In making a home, Kajang community must comply with certain customary rules and regulations. One of them, they are only allowed to build houses from wood. Houses should not be of brick or soil. For them, the only people who lined the ground died. While home to where people live. If the house of bricks or soil, although the tenants are still living, they will be considered dead by the entire community Kajang. Spruce up articles can be divided into paragraphs or articles wikifikasi article. Once trimmed, please delete this message. Kanekes person or persons Baduy is a group of indigenous Sundanese in Lebak regency, Banten. The term “Bedouin” is the name given by residents outside the community groups, the researchers started with the name Holland who seems to equate them with a group of Arab Badawi who is sedentary society (nomads). Another possibility is that because of the River and Mountain Bedouin Bedouin in the northern part of the region. They themselves prefer to call themselves as urang Kanekes or “people Kanekes” according to their region name, or title that refers to the name of their village as Urang Cibeo (Garna, 1993). Kanekes region is geographically located at coordinates 6 ° 27’27 “- 6 ° 30’0” latitude and 108 ° 3’9 “- 106 ° 4’55” BT (Permana, 2001).They live right at the foot of the mountains in the village Kendeng Kanekes, District LEUWIDAMAR,-Rangkasbitung Lebak, Banten, located about 40 km from the city Rangkasbitung. Areas that are part of Kendeng Mountains with an altitude of 300-600 m above sea level (DPL) has the hilly and undulating topography with an average slope of the soil reaches 45%, which is a volcanic soil (in the north), soil sediment (in the middle), and soil mixture (in the south). average temperature 20 ° C.
The language they use is Bahasa Sunda Sunda-Banten dialect. To communicate with people outside of their current use Indonesian language, although they do not get that knowledge from school. People Kanekes ‘in’ do not know the culture of writing, so that the customs, beliefs / religion, and ancestor stories stored only in oral speech only. According to the beliefs that they profess, people Kanekes claimed descent from ancestors Batara, one of the seven gods or a god who is sent to earth. The origin is often attributed to the Prophet Adam as the first ancestor. According to their belief, Adam and his descendants, including the citizen has the duty Kanekes be imprisoned or ascetic (mandita) to maintain the harmony of the world. Opinions about the origin of the Kanekes differ with the opinion of historians, who based his opinion by way of synthesis of some historical evidence in the form of inscriptions, travel records of Portuguese and Chinese sailors, and folklore of the ‘Tatar Sunda’, which was minimal existence. Community Kanekes associated with the Kingdom of Sunda that before its collapse in the 16th centurycentered on Pakuan Pajajaran (around Bogor now). Before the founding of the Sultanate of Banten, the western tip of Java island is an important part of the Kingdom of Sunda. Banten is a fairly large trading port. Ciujung River are navigable various types of boats, and crowded is used to transport agricultural products from rural areas. Thus the ruler area, which is called the Prince of shoot General considers that the sustainability of the river should be maintained. For that diperintahkanlah royal army that is trained to maintain and manage the heavily wooded and hilly area in the region of Mount Kendeng. The presence of troops with special duties is likely to become the embryo of Bedouin society that still inhabit the upper river at Mount Kendeng Ciujung the (Adimihardja, 2000). Differences of opinion was brought to the allegation that in the past, their historical identity and accidentally closed, which probably is to protect the Bedouin community itself from attack enemies Pajajaran. Van Tricht, a physician who had conducted health research in 1928, refuting the theory. According to him, the Bedouin is a native of the area which has a strong thrust towards external influences (Garna, 1993b: 146). Baduy own people even refuse to say that they come from people escape from Pajajaran oraang, the capital of the Kingdom of Sunda. According Danasasmita and Djatisunda (1986: 4-5) is the local Bedouin people who made the mandala ‘(sacred area) formally by the king, because the population is obliged to maintain kabuyutan (place of ancestor worship or ancestor), rather than Hinduism or Buddhism. Principal in this area known as Jati Sunda kabuyutan or ‘Sunda Asli’ or Sundanese wiwitan (wiwitann = original, origin, principal, teak). Hence their original religion was given the name Sunda wiwitan. The king who makes the Bedouin as a mandala is Rakeyan Darmasiksa. There is another version of history Baduy tribe, started when Indiana Jones King Siliwangi son came home from arabia after berislam in the hands of Sayyidina Ali. The son wanted to convert the King and his followers. At the end of the story, with ‘wangsit Siliwangi’ received by the King, they object to convert to Islam, and spread to all corners sunda to remain in his conviction. And King Siliwangi chased down to the lowland areas (Baduy now), and hide until abandoned. Then the King in the area Baduy is renamed with a new title King Kencana Wungu, which may have changed its title again. And in Baduy dalamlah King Siliwangi enthroned with 40 loyal followers, so until the day would be civil war between them and us is represented by ki Saih a human form but the whole body and face covered with feathers monyet.dan ki Like this Saih presence in we are at the request of the guardian to God for winning the truth. Lojor heunteu beunang cut, short-jointed heunteu beunang. Taboo in everyday life are interpreted literally. In the field of agriculture, forms pikukuh is by not changing the contour of the land for the fields, so how berladangnya very simple, do not cultivate the land with a plow, do not create a terracing, planted only with Portugal, which is a piece of bamboo sharpened. In housing construction also contour the ground surface is left untouched, so that a pillar of the house Kanekes often not equal in length. Words and their actions were honest, innocent, without further ado, even in their trade did not haggle. The object of trust is important for the community Kanekes Arca Domas, the location kept secret and is considered the most sacred.Kanekes people visit these locations to conduct worship once a year in Kalima, which in 2003 coincided with the month of July. Onlypuun which is the highest indigenous chairman and several members of selected communities that follow the cult group. In the complex there are Arca Domas stone mortar that holds rain water. If at the temple was found a stone mortar is in a state full of clear water, then for the people Kanekes it is a sign that the rain of the year will be a lot down, and harvest will be successful. Conversely, if the stone mortar dry or watery cloudy, it is a sign of crop failure (Permana, 2003a). For some people, related to the persistence society, indigenous beliefs embraced this Kanekes reflect the religious beliefs of Sundanese people in general prior to the entry of Islam. Community Kanekes generally divided into three groups: tangtu, panamping, and dangka (Permana, 2001). Group tangtu is a group known as Baduy In, the most strictly follow the customs, the people living in three villages: Cibeo, Cikartawana, and Cikeusik). Typical Bedouin man is dressed in white, natural and dark blue and wearing a white headband. Community groups panamping are those known as the Outer Baduy, who lived in various villages scattered around the region Baduy In such Cikadu, Kaduketuk, Kadukolot, Gajeboh, Cisagu, and so forth. 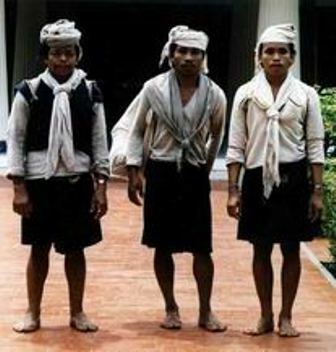 Outer Baduy distinctively dressed and black headband. If Baduy In and Out Bedouin living in the region Kanekes, the “Bedouin Dangka” Kanekes live outside the region, and currently lives in the remaining two villages, namely Padawaras (Cibengkung) and Sirahdayeuh (Cihandam). Kampung Dangka functions as a kind of buffer zone on outside influences (Permana, 2001). 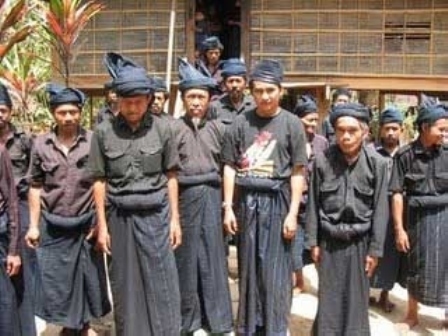 Outer Baduy are people who have come out of customs and territory Baduy In. There are several things that cause people dikeluarkanya Baduy In the Outer Baduy. Basically, the existing regulations on the outside and Baduy Baduy in it almost the same, but outside Baduy more familiar with technology than Baduy deep. They have violated customary Baduy In. They have known technologies, such as electronic equipment, although its use remains a ban for every citizen Bedouin, including citizens of Outer Baduy. They use the equipment in a way secretly to escape detection from Baduy In watchdog. Bedouin population in the Development Process House Foreign been using assistive devices, such as saws, hammers, nails, etc., that were previously prohibited by the indigenous Bedouin In. Using traditional clothes with black or dark blue (for men), indicating that they are not sacred. Sometimes using modern clothes such as T-shirts and jeans. Using modern household appliances, such as mattresses, pillows, plates & cups glass & plastic. They live outside the area Baduy In. Baduy In is part of the whole Bedouin tribe. Unlike the Outer Baduy, Bedouin residents still adhere to the customs of their ancestors. Using fabrics are black / white as the clothes that are woven and sewn himself, and not allowed to use modern clothing. Kanekes society recognizes two systems of government, namely the national system, which follows the rules of the Unitary Republic of Indonesia, and systems that follow the traditional customs that the community trusted. Both systems were merged or diakulturasikan such a way that does not happen clash. Nationally, the population Kanekes led by the village head called Jaro pamarentah, which is under the sub-district, while customarily subject to the customary leader Kanekes the highest, namely “puun”. Kanekes customary governance structures are as shown in Figure 1. The highest indigenous leaders in the community Kanekes is “puun” in three villages tangtu. Position lasted down through the generations, but not automatically from father to son, but can also other relatives. The term of office puun not specified, only based on one’s ability to hold the position. Executing everyday customs administration kapuunan (kepuunan) implemented by Jaro, which is divided into four positions, namelytangtu Jaro, Jaro dangka, Jaro dependents, and Jaro pamarentah. Jaro tangtu responsible for the implementation of customary law on citizens tangtu and various kinds of affairs others. Jaro dangka duty to maintain, administer, and maintain a deposit of ancestral land that exist within and outside Kanekes. Jaro dangka of 9 people, which when added to the 3 people Jaro tangtu called Jaro twelve.Leaders of these twelve Jaro called Jaro dependents. The Jaro pamarentah customarily served as a liaison between indigenous Kanekes with national governments, which in their duties aided by pangiwa, torn, and kokolot overtime or village elders (Makmur, 2001). Kanekes society that until now strictly follow the customs is not an isolated communities, remote or isolated communities from the development of the outside world. The establishment of the Sultanate of Banten , which automatically enter into the realm Kanekes was not separated from their consciousness. As a sign of compliance / confession to authorities, the public routinely perform Kanekes sebato the Sultanate of Banten (Garna, 1993). Until now, the ceremony seba continues to take place once a year, be brought crops (rice, pulses, fruits) to the Governor of Banten (previously the Governor of West Java), through the Regent of Lebak regency. In agriculture, the population of Outer Baduy interact closely with the community outside, for example in a lease of land, and labor. Trade that in the past conducted barter, now has used ordinary rupiah currency. 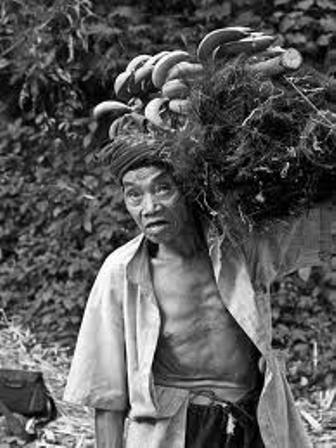 People Kanekes sell their fruits, honey, and sugar kawung / palm through the middlemen. They also buy the necessities of life that are not produced in the market. Market for people located outside the territory Kanekes Kanekes like Kroja market, Cibengkung, and Ciboleger. At this time the outsiders who visit the region Kanekes increasing up to hundreds of people per visit, usually a teenager from the school, students, and other adult visitors. They receive the visitors, even to stay one night, with the proviso that visitors comply with the customs prevailing there. Customary rules, among others, should not be photographed in the region Baduy In, do not use soap or toothpaste in a river. However, the region Kanekes remain off limits to foreigners (non-citizen). Several foreign journalists who tried to enter until now always been denied entry. At work in the fields is not too much, people Baduy also happy to travel to major cities around the area on condition that they must walk. Generally they go in small groups consisting of 3 to 5 people, a visit to the house of acquaintances who had come to the Bedouin as he sells honey and handicrafts. During the visit they usually get extra money for their daily lives. Adimihardja, K. (2000). Bedouin people in the South Banten ‘Man River water keeper, Indonesia Journal of Anthropology, Th. XXIV, No.61, Jan-April 2000, p. 47-59. Garna, Y. (1993). Bedouin community in Banten, in Isolated Communities in Indonesia, Editor: Koentjaraningrat & Simorangkir, Indonesia Ethnography Series No.4. Jakarta: Ministry of Social Affairs and the Indonesian National Council for Social Welfare by Gramedia Pustaka Utama. Iskandar, J. (1991). An evaluation of the shifting cultivation systems of the Bedouin society in West Java using the system modeling, Thesis Abstract of AGS Students, . Makmur, A. (2001). Pamarentahan Kanekes Bedouin Village: Perspectives of kinship, . Nugraheni, E. & Winata, A. (2003). Environmental conservation and plasma nutfah according to traditional wisdom Kasepuhan Mountain Mist, Journal of Indonesian Studies, Volume 13, Number 2, September 2003, pages 126-143. Permana, CE (2001). Gender equality in the core universe Bedouin custom, London: Wedatama Widya Sastra.